Our most affordable 2.4GHz full range receiver with built-in telemetry, the Graupner GR-12L 6 Channel receiver is small sized and lightweight, lending itself very well for small park flyers, lightweight hand launch sailplanes, helicopters and multirotors. The ultra-low voltage requirements of the GR-12L allows it to operate on a single-cell LiPo making ideal for DLG gliders. I bought two of these to put in a bnf I bought and a small foamboard plane I built. They work perfectly. Six channels, passed range test, very responsive, no issues what so ever... What more could you ask for? Note that I use a Graupner MZ24 transmitter if that helps. Not sure if this is the best price you could get, but these are certainly not knock-offs, otherwise I'd roast them. Identical to the one that came *free* with my transmitter. Buy with confidence as long as you know what you are getting and what you need. I also used one for the PC interface to my simulator and it worked just fine. When 6 channels will do (throttle, aileron, rudder, elevator, then perhaps arm and flaps for the other two?) this one will meet your needs. Clear skies! SMALL, BUT FILLS THE NEEDS FOR ANY BUILD. HAS THE DISTANCE NEEDED FOR FLIGHTS, AND FILLS ALL THE REQUIREMENTS NEEDED FOR THREE AND FOUR CHANNEL PLANES. I WILL BUY MORE AS NEEDED FOR FUTURE BUILDS. BEST BUY YET LOVE THIS RECEIVER. THANKS FLIGHT TEST. This is a great receiver for the price. This is an excellent receiver at a good price. I have more than one. I am using this model in both gliders and powered airplanes. Never a single problem. The built-in telemetry is great. Small and light. Highly recommended. I recently bought A MZ-24 transmitter and several receivers. so far I have been very happy the quality is very good and I would recommend it. So far I have used this receiver in 3 park flyers. I have flown in small areas as well at our flying field with more space and have found the receiver to be flawless so far. I only have about 30 flights to date but happy with the performance thus far. Binding with the radio is simple and have yet to have any issues with range testing. The single antenna works well with park flyers but it would be pretty short if you are using in a larger plane trying to be away from other electronics. For my larger planes I have installed the dual antenna GR 16L but the GR12L would probably do the job. I HAVE BEEN USING THE GRAUPNER 16L WITH THE TWO ANTENNA LEADS BUT IN A CRASH AT LEAST ONE OF THE LEADS ALWAYS BREAKS OFF. GOING SMALLER WITH A SINGLE ANTENNA IS THE WAY TO GO WITH THE MINI'S LIKE THE ARROW AND THE VERSA WING. EASY BOND WITH THE TRANSMITTER AND WITH ONLY THE THREE LEADS THROTTLE LEFT RIGHT ELEVON IT IS MORE THAN ENOUGH FOR THIS RECEIVER AND BECAUSE OF THE SMALLER SIZE FITS EASILY INTO ANY CLOSE QUARTERS. I THINK I LIKE THE 12 BETTER THEN THE 16L ESPECIALLY FOR THE MINIS. NOW WHEN I MOVE UP TO THE MORE DIFFICULT PLANES I.E. THE CORSAIR AND THE P51 WITH MORE CONTROL SURFACES I KNOW THE 16L WILL BE THE WAY TO GO. Q: Can this be used in a 40 to 60 sized rc balsa wood airplane? I have the MZ-18 if that helps. A: Yes, no problem. Just make sure that the antenna is not close to any metal or carbon objects. Q: Can this be used as a satellite receiver? Do I need satellite receivers for your system? I have the MZ-18 if that helps. A: You do not need satellite receivers when using Graupner technology. The GR-12 receivers are practically full range receivers unless you use air-frames that use carbon for which you will use a GR-16L or GR-24L receiver. A: No, this is not possible with the mz-24 TX. Binding 2 receivers will give you only redundancy. If you need 12 channels you should get the 12CH receiver. Q: Will this receiver bind with a first generation Spektrum transmitter? A: It will not bind with any Spektrum receiver as the protocols are completely different. Q: hello, i'm trying to bind this receiver with an mx20. i have a cc3d flight controller and im trying to build a mini quad with this. i can't figure out the pin connections? please help. 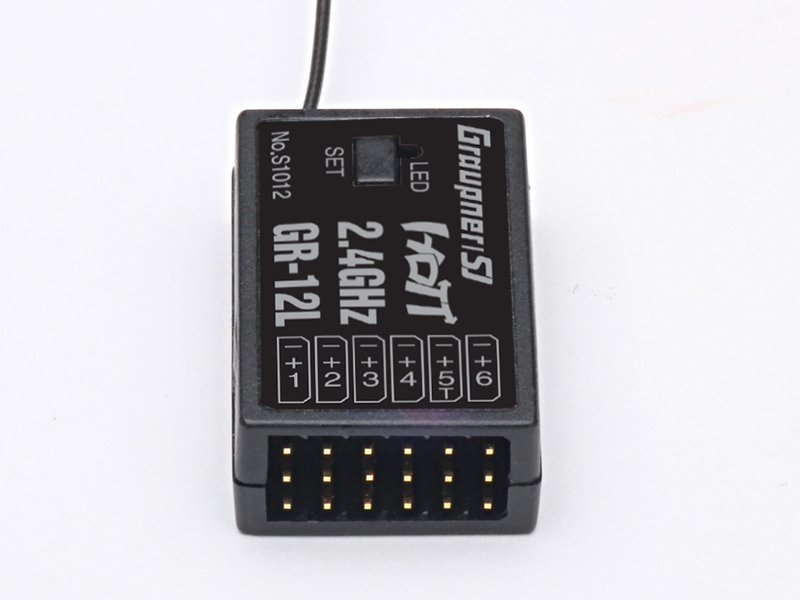 A: You will have to use the digital output of the GR-12L to connect it to your flight controller. The GR-12L support SUMD which you can activate through the telemetry/settings and data view option on your radio. When properly set you will have CH6 output the signal to your flight controller. You can simplify your installation by considering using one of our ready to go combine receiver and flight controller products like the GR-18C or GR-10C. Q: What's the difference between the 2 GR-12L receivers? Other than the price, I can't tell and there isn't any way to compare items on your site. A: Please check the GR-12 product page Q&A which should answer your question. Q: what is the range of your 6 ch recievers? I fly my old timers as high as I can see them, around 1500 ft..
A: It should be no problem but at those altitudes we recommend a dual antenna receiver like the GR-16. Q: Is there's a manual that comes with the 12L, I never received one? Please send . A: Please check the product page download tab. Q: Can LiPo batteries be used with your receivers? I noticed that you only list NiMH batteries for receivers. A: You can use any battery chemistry for as long as you do not exceed the maximal voltage of 8.4V which is 2S Lipo.